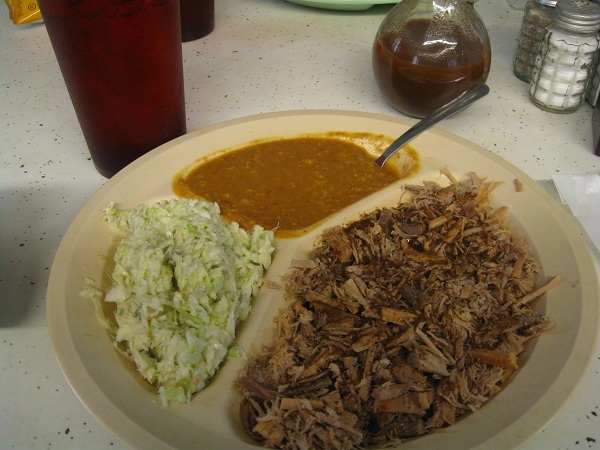 Zeb’s Bar-B-Q, Danielsville GA – Marie, Let's Eat! 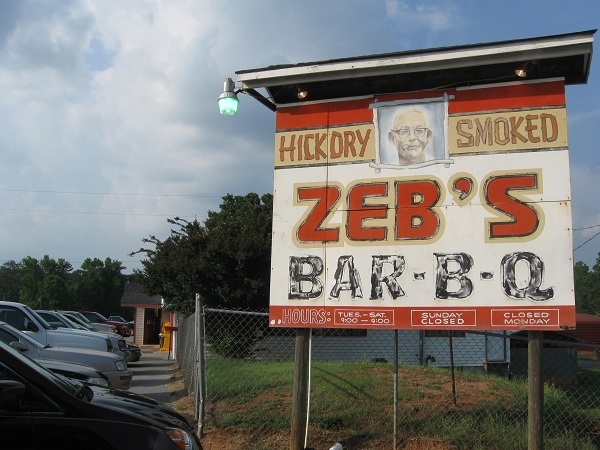 At some point in the early ’90s, I drove from Athens to Greenville, South Carolina up US 29 and passed by Zeb’s Bar-B-Q, a little roadside restaurant in the oddest location. It’s about seven miles north of Danielsville, about halfway between that town and Franklin Springs, in between nothing whatsoever and a field. I thought that delightful, hand-painted sign out front was laugh-out-loud charming and quaint and wished Zeb well indeed as I sped on by. I don’t know what I thought I would be doing in Greenville, but I’m reasonably positive that I wasn’t going to eat as well there as I could have, had I stopped here instead. A couple of years later, Zeb’s got a favorable write-up in the Flagpole Guide to Athens that I mentioned in a previous entry. I made the first of what would be many return visits, for Zeb’s became one of my favorite places. Maybe it was a little too far away for a regular jaunt, and up a road without much else to do, so I never became a regular, but if I were to rank them, I’m certain Zeb’s would certainly remain in my top ten list of barbecue restaurants in the state. Everybody else seems to have a quibble. Marie doesn’t much care for their slaw. More than ten years back, Randy came up here with me and hated the sauce. My first wife said this was the only stew in the state that she didn’t like. Everybody else, frankly, is crazy and wrong. Taking objections in reverse order, this is indeed the only stew I’ve ever eaten made from a creamed corn base. It is utterly unlike anybody else’s, but not for the faint of heart. Zeb’s is so confident that you’ll love this thick stuff that when you order a large plate, you can call for a second helping of stew. I’ve often had the desire, although never the room, for a third. Sensibly, they do not call their stew a Brunswick stew; it isn’t. And the sauce, well, that’s pretty amazingly neat, too. It is a vinegar-based sauce, with a lethal mix of pepper sunk to the bottom of the glass bottle, which the server brings to your table piping hot. The bottles are a mix of knickknacks from various antique stores, so sometimes you get a cubical crystal decanter, and sometimes a great bulbous bottle. If you like your barbecue mild, you just give the sauce bottle a gentle shake to mix the ingredients a hair. The more vigorous the shake, the spicier the outcome. If you start a tornado in the bottle, then your meal will end with incredibly satisfying crackling pepper explosions throughout your mouth and in pores of your tongue that you didn’t know were there. As for the slaw, it’s made with vinegar that has never heard of mayonnaise. I think it’s incredibly tasty, and one of the few occasions that I will say that Marie is just plain wrong about a matter. On the other hand, she raves about the pork, the stew and especially the sweet tea, which she claims is somehow even better than Paul’s. She’s not right, but it’s not a point I feel compelled to argue. Zeb himself passed away more than twenty years ago, but his restaurant has been going strong in its third generation of family ownership. It’s said to be much the same as it was when it opened in 1946, and, back in the good old days when Clemson and UGA played each other every September, there was a line far out the door on gameday, as travelers from one town or the other stopped in for tailgating supplies. This place gets pretty packed on Saturday evenings, too, as it’s just about the only restaurant of note for ten miles. Well, I am curious about this one place that I think might be called Napoleon, back down the road in the Danielsville city limits, but for inexpensive, family eating surrounded by Bulldog and Dale Earnhardt memorabilia, this is the local favorite. I rarely have barbecue twice in a day, but it had been a really long time since we came out this way for this wonderful sauce and stew, so we made this our supper after having lunch forty-ish miles down the road at Paul’s, spending the afternoon in Athens, shopping, visiting friends, and walking at the State Botanical Gardens. In fact, the last time I was here, Marie and I had only been dating for a few months, so it’s been close to three years now. Funny how time slips away like that. It’s every bit as good as it was in the late ’90s, and honestly, if there’s a more satisfying ending to any meal in northeast Georgia than that wonderful slow burn of your tongue after you’ve ladled on that well-shaken sauce, I can’t think of one. We need more excuses to pop up this way. Somebody open up an unbelievable old six-story bookstore in Danielsville or Royston, okay? Posted on May 19, 2010 July 27, 2017 by Grant G.Posted in athens, barbecue, georgiaTagged athens, barbecue, barbecue - our favorites, danielsville, georgia. Good review, guys. Adding to my wishlist. Zeb’s Bar-B-Q , and Brunswick Stew are the best in the world. They are certainly up there in our book! We’ll try to get back to Zeb’s for a follow-up and take some new pictures next year. Thank you for writing! Pingback: Pig O’s Bar-B-Que, Crawford GA – Marie, Let's Eat! Pingback: Circumnavigating South Carolina – part four – Marie, Let's Eat! Pingback: Dean’s Barbeque, Jonesboro GA – Marie, Let's Eat! When my hubs and I lived in Athens we always went to Zeb’s after floating the Broad River. We’re way overdue for another trip!